A regular presence on New York City’s variety scene, Tanya Solomon blends vaudevillian magic with offbeat comedy. Tanya specializes in bringing humor and fun to startling effects. Her stage acts range from 3-minute variety show bits to her full-length solo show “Tanya Solomon: Truth Assassin”. One of magic’s very few female performers, she also entertains with strolling magic at private and corporate events, and performs for kids as “Razzle Dazzle”. 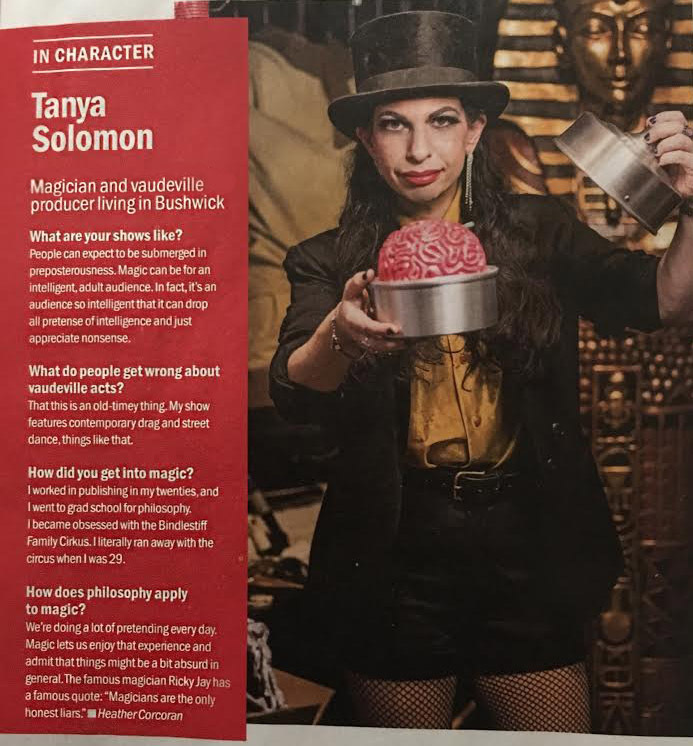 Tanya’s experience includes touring the US with her solo show, traveling with the Bindlestiff Family Cirkus, performing in festivals in Europe, MCing underground parties in Brooklyn, and being a cast member of Coney Island Sideshows by the Seashore. She has also produced variety shows, including Wonder Farm Cabaret in New Orleans and Force Majeure Vaudeville in New York. For more information or to book Tanya, please see menu above.